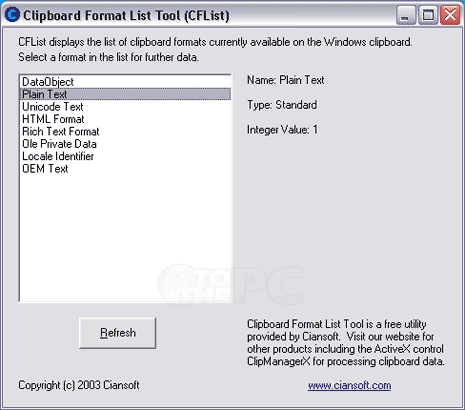 Want to see list of formats supported by clipboard on your computer? Free portable tool “CFList” make this all easy. It shows list of formats currently available on the Windows clipboard on the left side. You can click on either format to see more details on right side like: name, type and integer value. 1. Download CFList utility & unzip it. 2. Double click CFList icon to launch it, no install required. 3. View current supported clipboard formats. You can click Refresh button to update the clipboard formats list. One small and portable tool to see clipboard formats with ease. You also can use Sharp IMG Viewer 2008 application to examine clipboard formats. The .NET application can be downloaded from sites.google.com/site/sharpimg/viewer. You can find more detailed information reading documentation.